Disco a go go – HubNut – celebrating the average! Last week, I did use it for a long-ish distant trip, but found it wasn’t as comfortable as I thought it was. It also reminded me just how unwieldy it is on twisty roads. Yes, it handles very well for something with a steering box, beam axles and so much weight so far from the ground, but it always feels heavy, especially when braking. I don’t really like that. So, sensible head wins again. It really must go. I’ve got a lot of long-distance driving to do this year, and sadly my trip to Leicestershire in the 2CV has only reminded me how regular long distance driving really wallops my admiration of the Tin Snail. It was never built for motorways and driving it out of its comfort zone takes me out of mine too. A 2CV on a motorway should be an occasional adventure – one to savour. Just getting from A to B as quickly and as smoothly as possible is not its forte. You really are driving a 2CV at its limits at motorway speeds, and while it’ll happily lap up the abuse, it’s hardly relaxing. What the replacement will be, you can only guess at. To be honest, I’m playing a guessing game myself. I may be getting an Citroen XM, but the purchase is not exactly going smoothly. A hydropneumatic Citroen seems a sensible option though. No other car rides in quite the same way, and 1980s/90s hydro-Cits combine ride and handling in a quite spell-binding way. 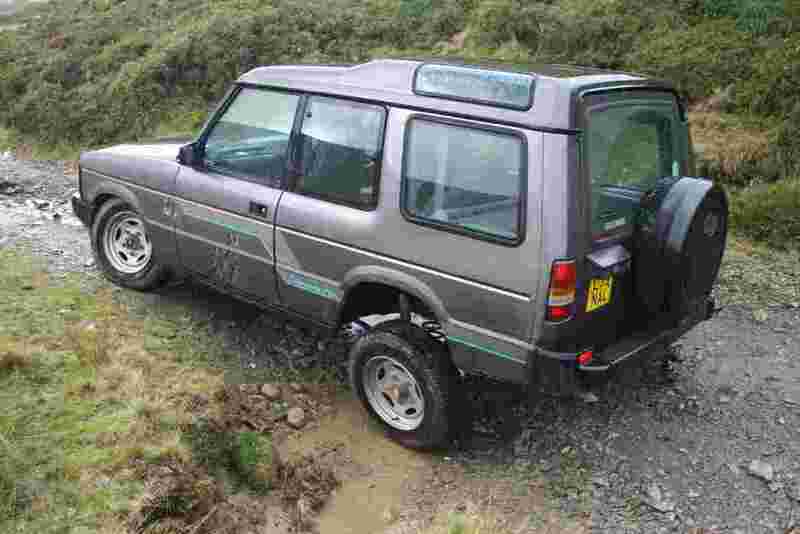 In the meantime, the Discovery is for sale with an asking price of £795. It’s not one of the best, but it’s a sound basis for further improvement. I may be sad to see it go, but perhaps it’s better to say goodbye while the memories are still fond. After all, few vehicles manage to combine the glorious looks of a Mk2 Transit, the humped roof of a Citroen CX Safari and lighting pinched from Maestros and Sherpas quite so well. I’m glad I have many photos of it. I would say you are in a dead-end-street with your promiscuous behaviour regarding your cars. You always buy very cheap ones that are at the end of their lifespan, drive them a few weeks until you recognise it yourself and then you sell it on. with the wish to get a “proper” car now. Just to buy the next old banger for almost no money. Result? Look above! I´m a bit like that too, but sometime ago I got it right. Just split your fleet up. Get one proper car (<10 years old, < 100.000 mls) you keep for two or three years and you do the driving that is necessary because of work or fast A to B-traffic. You will not love it, it´s not in your heart, but it doesn´t have to be. Of course it will be more expensive than an old banger and it will even depriciate a bit more, but this money will be lost with the 3 bangers you will have to buy and repair in the same time too. And the other cars (2CV and Disco or BX etc.) are just hobby-cars for local journey, for spannering, for driving because it´s fun. I did it this way and I´m happy with it. In the long-run, you will not loose more money and it´s the better aka less stressful way. I like being promiscuous though! I’ve owned nice cars (Scimitar, Westminster) and still got bored with them after five minutes! The Discovery has survived 9 months now, which is some sort of record.